Romania will next take on France in the Fed Cup semi-finals. 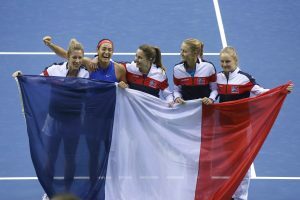 Romania pulled off one of the great upsets in Fed Cup by BNP Paribas history when it dealt the defending World Group champion Czech Republic a 3-2 loss, its first home tie defeat in 10 years, in Ostrava on Sunday evening. With the tie even at 2-2, it came down to a decisive doubles rubber, which matched underdog Romanians Irina-Camelia Begu (ranked 35th in doubles) and Monica Niculescu (51st) against the top-ranked Czech pair of Katerina Siniakova and Barbora Krejcikova, who just happen to be the reigning French Open and Wimbledon champions. Playing in front of a packed Ostravar Arena crowd that numbered more than 6,000 fans – most of them cheering loudly and proudly for the Czechs – Begu and Niculescu came from a set down to pull out a 6-7 (2), 6-4, 6-4 victory that lasted almost three hours. With nothing to lose and everything to gain, the 31-year-old Niculescu showed brilliant anticipation around the net time and again throughout the rubber. Her forehand volley winner clinched Romania’s upset victory and secured her country’s berth in the April semifinals against France. It was Niculescu’s 31st Fed Cup triumph in 12 years of representing Romania. “It was so tough because we played the No. 1 in the world,” said Niculescu during a TV interview afterward, still in shock. “We knew we had to be sharp – and it worked. It worked! … I wanted so much to win. The crowd helped us. 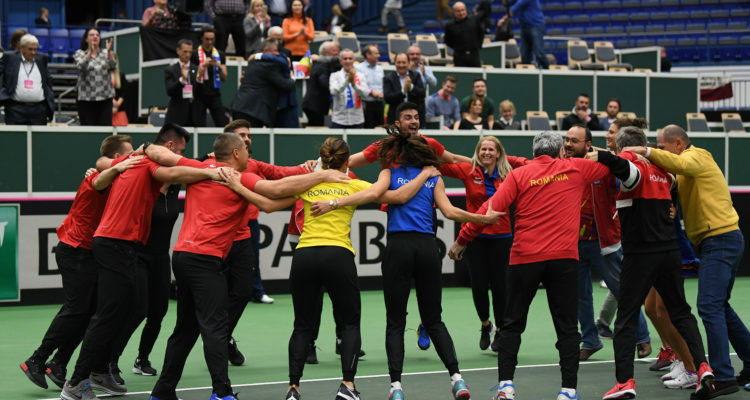 I have no idea how we won, but I think the crowd was behind us and supporting us.” Indeed, there was a small but enthusiastic group of Romanian fans sitting behind the team bench, cheering and screaming every point Begu and Niculescu scored. “My best day – and there’s more to come,” Niculescu added. France’s No. 1 singles player Caroline Garcia, ranked 19th in the world, made her return to Fed Cup for the first time since the 2016 final a memorable one. She scored a pair of victories that lifted the French over Belgium in Liege. First, on Saturday, she beat Alison Van Uytvanck, 7-6 (2), 4-6, 6-2. Then, she clinched the tie for France with a 6-2, 6-3 win over No. 21 Elise Mertens. She attacked her opponent throughout the 77-minute rubber and secured match point with a backhand lob on the run that was followed with a forehand winner. Garcia improved to 10-4 in Fed Cup singles and 15-5 overall. • On Monday, the ITF announced the seeds for the World Group and World Group II playoffs. The draws, which will be streamed live on the Fed Cup’s website (www.fedcup.com), will take place on Tuesday, Feb. 12, at the ITF headquarters in London starting at 12:00 p.m. GMT. The four seeded nations in the World Group playoffs are: 1. Czech Republic; 2. United States; 3. Germany; 4. Belgium. The seeds are based on the new Fed Cup Nations Ranking as of Feb. 11. Each of the seeds will be drawn against one of the following four unseeded nations: Canada, Latvia, Spain and Switzerland. The four seeded nations in the World Group II playoffs are: 1. Russia; 2. Netherlands; 3. Great Britain; 4. Slovakia. Each of the seeded teams will be draw against one of the following four unseeded nations: Brazil, Italy, Japan and Kazakhstan.